This image is one of my best sellers. People seem to be drawn to the elephant calf leaning against its mothers leg. It seems to connect the animal world with the human world and conveys we are all sentient beings with feelings and emotions. An artist in the UK contacted me in 2012 to draw this image and donate the original to the David Sheldrick Trust who were hosting an inaugural fundraiser in London. I was honored and the resulting image was really quite beautiful. I am thrilled that this sweet little elephant managed to raise one thousand British Pounds at auction. 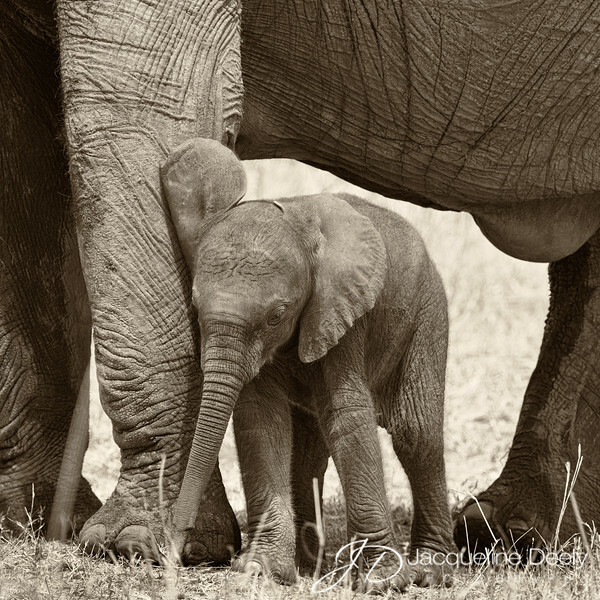 Founded in 1977 by Dr. Dame Daphne Sheldrick D.B.E. in honor of the memory of her late husband, The David Sheldrick Wildlife Trust is today the most successful orphan-elephant rescue and rehabilitation program in the world and one of the pioneering conservation organizations for wildlife and habitat protection in East Africa. At the heart of the DSWT’s conservation activities is the Orphans’ Project, which has achieved world-wide acclaim through its hugely successful elephant and rhino rescue and rehabilitation program. The Orphans’ Project exists to offer hope for the future of Kenya’s threatened elephant and rhino populations as they struggle against the threat of poaching for their ivory and horn, and the loss of habitat due to human population pressures and conflict, deforestation and drought. To date the David Sheldrick Wildlife Trust has successfully hand-raised over 150 infant elephants and has accomplished its long-term conservation priority by effectively reintegrating orphans back into the wild.